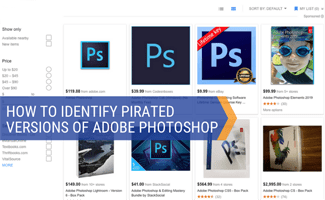 A past experience with purchasing a counterfeit version of Adobe Photoshop off Ebay has gotten us to realize just how rampant software piracy is. To find out – just type “Photoshop CS” (or Photoshop Anything) into a Google search and click on the “Shopping” tab. Among the sponsored ads you’ll see ads for Photoshop and other Adobe products selling for less than half of retail. Most of these are ads bought via Google’s Adwords by online shops specializing in counterfeiting, while others are selling their pirated wares on Ebay and Amazon marketplace (note I say marketplace, which is for resellers – if an item ships directly from Amazon.com you can be fairly certain it’s legit). Unfortunately, we have yet to find one that is legitimate. Bottom line – to purchase Photoshop, buy directly from Adobe using the links we provide below. 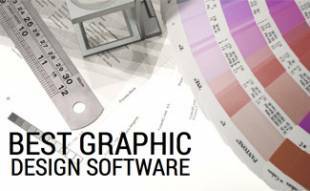 If you can’t afford the high price tag, consider some of the alternative graphics software we detail below. The serial number/CD key is printed on the CD, sleeve, or jewel case. Then there’s a good chance it’s not legitimate. Piracy is slightly less of an issue than it used to be, now that Adobe is offering its products in the cloud (ie. online). The pro of this approach for consumers is that you can now pay a monthly fee for access, as opposed to having to pay for the entire software package at one time. Another pro is that you’ll always have the most up-to-date version. In fact, Adobe no longer supports or updates “permanent” or “physical” copies of its software. Check out pricing plans for Adobe Photoshop CC, starting at $9.99/month. The truth is, most people who run pirated copies of Photoshop don’t need or use 95% of the functionality and features the software offers. So you might try one of these options. You’ll probably be just as content working with a copy of Photoshop Elements for PC (Mac version) or one of the alternative photo editing applications below. In fact, our own graphic designer at WeRockYourWeb uses PhotoShop Elements and it’s nearly the same thing (for a fraction of the cost). Another, more powerful alternative (and competitor to Photoshop) is Paint Shop Pro. It offers many of the power user/ professional features that Photoshop offers, albeit using a different layout, and at a much discounted price. Note that it’s not a bad idea to try out demos of products before you buy them. Adobe, for instance, let’s you setup an account and download 30-day trial versions of nearly all their products. And finally, there’s the GIMP. GIMP is often referred to as the “Photoshop clone” of the open-source world. It is, in fact, a very powerful photo editor/ image editing application that will let you do nearly everything you can do in Photoshop. If you’re new to image editing, I would recommend you give it a try first. If you’re already a Photoshop user, it’ll take some time to get adjusted to the interface, and finding your way around the program. But once you do, you probably won’t look back. There are ways to modify GIMP to look like Photoshop. However, we don’t discuss specifics anymore here because some of the sites hosting these solutions have been infected with malicious software. You should also note that GIMP fans balk at this application because they consider GIMP’s layout to be far superior to that of Photoshop in the first place. We’ll let you be the judge. Check our reviews of other photo editing software options; includes features, pros, cons, pricing and our picks for “best for” in various categories. Are You Considering Photoshop CC? Or Going With An Alternative? Well, Adobe steals from their customers, so I say go ahead and do it back to them. Wow! What a nice tips. Thank you very much for your tips. I’ve noticed a trend in the way that people see theft since virtual products became so popular. It is kind of disturbing view of the world actually. When I was a kid, I did not help my friends cheat on their homework because it was wrong. I did not share my homework with them because even though I was not stealing or using anyone’s work, the fact that I let the use mine would have made me just as wrong as they were. Or at least that’s what my parents taught me and it is what I pass on to my own children. Today, it seems that this is not longer the normal mode of thinking. So people who buy pirated software think that they are not doing anything wrong because they did not pirate the software. They even feel justified in this because they did pay someone for the software. If you are not buying it from a reputable source, then you are part of the problem. Whether you pay for it or not, the software is stolen. If you would not buy a watch from a guy who had collection of used watches in a bag he carried around, then do not buy pirated software either. I’m not sure whether or not pirated software is as common as it was in the late 90s and early 2000s, but it is still present. That’s why it’s essential to buy software from legitimate sources. This means either purchasing the software from the company directly or shopping with companies you can trust. However, as mentioned, you want to avoid shopping in marketplaces. When shopping for software, you always want to look for characteristics that tell you the software is legit. Many companies use holographic seals that make it easier to seek out the real deal. However, this is something that a serious criminal could duplicate, if they spent the money. Unfortunately, software isn’t the only thing that is pirated. I was amazed at a recent trip to a flea market in which there were multiple sellers selling pirated DVDs. These sellers didn’t even try to cover up the fact that these were copies. There were no cases, poor quality artwork, and unbelievable prices that all screamed that these were illegal copies. Why these sellers haven’t been caught is beyond me. They’re right there in the open and have several tables devoted to their business. The world will always have copies and fakes, which means the consumer needs to be more knowledgeable about their purchases. I’m shocked that Amazon Marketplace let’s sellers sell pirated software. Of course, I’m sure they don’t actually realize it’s being done until it’s brought to their attention, but still. This is something that makes it harder for legitimate companies to do business online. Personally, I think the best way to get a real copy, if you don’t want to shop online, is to visit a store you know you can trust, such as Best Buy. As someone who needs graphic software for my business, I have considered buying Adobe Photoshop for quite some time. However, recently I discovered a website called FotoFlexer that allows me to do what I need for free. It’s become my favorite website not only because it’s free, but it’s easy to use. I can now design my book covers in just a few minutes and get the results I want, rather than struggling with Paint. If I ever do purchase a copy of Adobe Photoshop, I will definitely not be buying it on eBay or from some third-party seller. When you’re spending several hundred dollars on a piece of software, it pays to purchase the software in person from a legitimate source or, as you mentioned, from the company itself. There are plenty of reasons why I do not buy pirated software. First off, it is just wrong. I would not want someone to steal my work, so I do not do it to anyone else. I know there are many who think that is a naive way to be when software companies make so much money, but there is a reason that they make good money. If the product was not worth buying, you would be developing it at home yourself. It’s just like any other service you have to pay for. I don’t know how to work on my truck, so I pay my mechanic to. I don’t know how to write software programs, so I buy them. Regardless of whether or not you think it is right or wrong, buying pirated software is also illegal. You might think you will never get caught, but when you buy pirated software, you are taking a chance that the person you bought it from might get caught. Don’t you think they are going to go over records to see who purchased this software? It seems to me that is far more trouble than I even want to think about dealing with. I know that in any economy it is tempting to buy pirated software, but in this economy it can be more than tempting. It can be hard to refuse. But there are several problems with this that go beyond meeting immediate needs. Adobe Photoshop is just one of the many software programs that are being pirated. You might save some money buying pirated programs like Adobe Photoshop. You might even be able to run the programs without harm to your computer. You might even get away with it, even though you are breaking the law by using these kinds of programs. But you are still doing something wrong. If you are buying pirated programs like Adobe Photoshop because you cannot afford the expense of the original program, maybe even due to the state of the economy, just know that you are part of the problem. You are not part of the solution. Every time someone steals anything, they cause the prices to go up. Companies have to spend money to trace the theft and in some cases, prosecute it. Just because you are not putting something in your pocket, it does not mean you aren’t costing that company money and that they aren’t going to seek a return through higher prices. I can’t believe how many comments on here are saying that it is not that bad to use pirated software. It seems like people just are not using any kind of common sense these days. It really is a big deal. I work in a creative line of work and I have had my work stolen before. I don’t care if I am only losing royalties on it. I made it. If you think that developing software is so easy that it should not be rewarded, why don’t you go develop your own software? Because you can’t. If you could, you would not be stealing someone else’s hard work. That really ticks me off that any consumer would even think that way. The software is expensive because of the skill, time, research, and effort that was put into developing it. Does this really have to be explained to anyone? There are quite a few people who do what I do for a living. Some of those people would tell you it is an easy job. Some of those people would tell you it is hard work. Not one of those people would tell you that it is fine for you to steal their work. If you think that people should not get paid for everything they do, why don’t you go offer your service for free somewhere? Thanks for the great article! I especially like the suggestion to try GIMP before purchasing the Photoshop software. Most of the people I work with find Photoshop very easy to use and they really love all the features of it. So, I am not finding fault in Photoshop itself. The fault is with my photo editing knowledge, or lack of. I used to have Photoshop software, but never really took the time to use it the way it was supposed to be used. Meaning, I did not use half of the features it offered just because I did not have the time to explore all of them and become comfortable enough to use them. So for me, it was kind of a waste of time to buy the program until I had the time to learn all that it can do. At this point, I really need to learn more about photo editing. I may take your suggestions and try GIMP first before I go all out and buy the Photoshop software. I think if I do this, I might not be so nervous to try all of the Photoshop features. At least I will find it more worthwhile to buy the program again. But, I would never buy it from anywhere but Adobe, just because I want the real version and I want the people who made it to get the benefits of their creation. First of all, I do not think I would bu any software that was not for children to play with off of eBay. If I am serious about software and not just buying a game for my son to play, that means I am working on something that I need the software for. I do not just go out shopping for software for the fun of it. That means I want a quality product that is going to do the job I require. The only way to do that is to buy from a reputable source. I am not saying eBay itself is not reputable, but you can’t really vouch for everyone on eBay. And you can almost guarantee that if you are buying software on places like that, if the price is really low, it is pirated. If you want a cheap photo editing program, there are plenty of free ones out there for you to use legally. But if you want a quality program, buy Photoshop or some other program that has a solid reputation. If you go any other route and it does not work out for you, it is your own fault. And do not rely on digital copies. Buy the actual program. If you have to buy a digital copy, make sure you do it through the company that makes it so you can go back later and get it again if something happens to your computer. The idea of pirating anything really ticks me off. It is not different than walking in a store and taking something from it. People don’t realize that all this does is drive up the cost for everyone else. I pay for what I get and I don’t like having to pay more in order to compensate for what people have taken. I work online and I have had my work stolen. It is an absolute pain to have anything done about it and people don’t really take it seriously. They seem to think that if they can’t hold it in their hand, it is not really theft. Wrong answer. When it comes to Photoshop even if I was a buyer of pirated software, I would not buy a pirated version of this software. Before I used Photoshop, my photos were not even close to what I wanted them to be. Photoshop made it much easier for someone like me to create professional looking photos without having to go take a bunch of classes to learn how to do it. Since these photos are part of my work, I would not feel right about any benefit I got from them if I did so using stolen software. Aside from that, it’s a business write off at tax time. I don’t agree I think software can’t be viewed as a physical object, there simply is no labor cost only imaginary figures applied to it in order to up sell. It loses its status as a commodity that can be traded or bartered, furthermore most licensing options these days don’t even allow that. You have no right as an end user to something you bought, what you are really paying for is a license right to use a virtual trade nothing more. It’s more or less how banks work in favor of issuing us a credit line, just because we receive one doesn’t mean we are unanimously entitled to it. Thus the companies can drop your license at any moment without notice, what would you do then? You would be breaking the law for having paid for something you no longer are entitled to the rights for. I am not leveraging this argument in favor of piracy, piracy is bad yes but it is also a good thing it breeds a healthy dose of competition and emergence of new enterprises. That is what Adobe and companies like it fear, not the loss of virtual trades but rather the emergence of something better than what they sell. It’s all economics and politics. Pardon my ignorance but really, why aren’t these sites being held responsible for what is being sold on them. Why does Adobe even sell products on these sites at all if the sites are also allowing pirated versions to be sold. Isn’t that kind of like just giving a wink and a nod? I mean, if I had a product and I went to a store that was selling pirated versions of my product, I wouldn’t just pull my product from them. I would sue them for selling what amounts to be stolen property. Are sites like Amazon and eBay not held responsible at all? The sad thing is that no one cares anymore. People used to care where they got their goods and whether the right place got credit for them. I mean, you wouldn’t buy a Ford knockoff because you wanted a Ford truck, so why would you buy pirated software? Does the fact that it takes up less room make it easier to do? Adobe makes some great software. They have enough of it free online to make up for prices they might charge on other items. So, shouldn’t people just be honest and give them credit where credit is due? One of the many problems with pirated software is that you never really know what you’re going to get along with the software you wanted in the first place. You might not even get the right software to begin with. You think you’re saving money but it doesn’t really work out like that in the long run. And, if you get caught, you can believe you’ll be thinking how cheap the real software was in comparison to the fines and time you’re going to have to put into it on the premise that you were saving a buck or two. When it comes to software like this, why would you even order it on ebay? I hate the way you sometimes have to download software instead of actually holding a disc in your hand. I want to be able to see and touch the things that I purchase. I certainly wouldn’t download something from a site like that. If I have to download it, I’d rather get it straight from the source. If you want to buy pirated software, just keep in mind that you’ll eventually be spending money to have someone fix your computer, in which case you may have to reinstall the software anyhow. And, since the pirated software is probably what caused the problem, you’re going to have enough brains to go to the original source. Why not just start there? I understand that people are trying to save money by making purchases through eBay, but let’s be for real here. The people who sell through eBay aren’t exactly trusted sources. And, as much as I hate to admit it, you most often get what you pay for. When it comes to eBay, I’m always leery about things like that. I don’t think I would ever buy software there at all. Isn’t that kind of like buying it from a yardsale, only you don’t actually get to see the product before you buy it? I do trust Amazon.com, but when it comes to this kind of thing you do have to make sure you buy it directly from Amazon and not from one of the people that sell products through Amazon. If you can’t afford to buy this software, there is plenty of software out there that doe a siilar job. And, some of that software is free to download. Of course, if you’re using it for professional reasons you should just bite the bullet and pay the price for the software you need. It’s tax deductible after all. This is very informative, thank you for posting the tutorial! My designer was working on our blog and almost purchased a pirated copy of Photoshop by accident. I spend a lot of time of photo editing, after reading this article I got to know a lot of interesting facts. Thanks about this information, this will really help me a lot. Thanks for sharing this useful post on how to identify pirated versions of Adobe Photoshop. It is a well known fact that Adobe Photo Shop is one of the most commonly stolen, duplicated or just plain pirated pieces of software. There are probably a number of reasons for this, but really two stands out. The program itself is an incredible piece of technology. The user who knows what they are doing can create amazing things with Photo Shop. Additionally, the program is very expensive. Some of these versions sell for over one thousand dollars. Combine these two ingredients and you have the perfect mix to create a number of thieves and counterfeiters. This article points out a number of ways in which someone can easily identify if their version of Photo Shop has been pirated. Honestly, though, probably the best way to tell if it is a pirated version is the price tag. If you are attempting to buy a version that would normally sell for a thousand dollars or more, and you can find copies listed at just 100 bucks, then something is probably wrong. Instead of all this, just try using the new CS6. In the above articles, I’m guessing that this Alex Schenker is the one who wrote the articles and yet there he states that Photoshop CS6 can be bought for $299.99, when all I can find is for $799.99. So if the less priced one is legitimate, why the heck can’t I find it at that price. I’m taking the Photoshop class right now and have it on a 30 day trial and need to get the program before the trial runs out so if anyone can guide me to a cheaper, but legitimate place to get it, please let me know. It is no secret that one of the most pirated pieces of software is PhotoShop. The thing is that this is very powerful and gives the users a tremendous amount of functionality and abilities in terms of editing photos, images and illustrations. Not to mention that the cost can be prohibitive for many people. The good news is that there are a number of cheaper alternatives to this program. Since most users do not ever need any more than about 5 to 10 percent of the features available, why not consider using an alternative? Paint Shop Pro is a nice option at a fraction of the price. This software does also include many of the most popular features and functions while only costing around 80 dollars. Another really great alternative is called GIMP. While I am not quite sure what it stands for, it will allow users to do most of what they can accomplish with PS. The best thing is that GIMP is free, open source software. For me, it did take a while to master, but it was time well spent! I have been a user of Adobe Photoshop now for over ten years. I am not a professional photographer by any means, but I certainly do enjoy the activity and with a robust piece of software with some legitimate editing tools I can truly achieve some good images that are impressive to both the untrained eye as well as the seasoned veteran. Knowing this and learning this over the years, the temptation to get newer versions of Photoshop is as strong as the newest tools and functions of the program are cool and fun to use. That being said, I have made the mistake of downloading pirated versions of the software myself and to very mixed results, mostly bad. The first time I downloaded a pirated version of Adobe Photoshop, it actually worked pretty well and I think the source was somewhat legitimate. However, this was many years ago and since then, every time I have tried to get a free download of this or any software, it has come rife with problems in the program and for my computer. Now I put up the money like everyone else. GIMP is short for GNU Image Manipulation Program. The whole idea is that you can take all of your images and play around with them to create some interesting designs and cool effects. It is an excellent option for photo retouching, painting, composting, image creation and even much more. Another really great feature is that since the software IS open source, there are tons of tutorials and user guides all over the internet that are actually helpful. It is true that GIMP may not be the most user friendly image editing software around. But it is free, and there are a number of really good tutorials out there. So anyone who really had the desire to learn how to use this tool effectively will not have a problem doing so. There is just so much that you can do in GIMP. You could take a cartoon image and make it into a fun picture. Actually this is pretty easy to do once you get used to working in GIMP. Better yet, are you familiar with the Orton effect? This is a technique that produces a dreamy, soft focus effect that may make a boring photo much more striking. One of the most commonly stolen and counterfeited pieces of software is Adobe Photo Shop. Since this is both very popular and very expensive, I suppose this is only natural. I also am quite sure that the manufacturer and creator are also well aware of this problem. Since many people are unwittingly using a pirated version of this software, this article does provide a number of ways to determine the legitimacy of your own copy. If you notice any of the following things, it may be a pirated version. Missing the warranty card, the serial number is printed on the cd, sleeve or jewel case (the real version should have a holographic image on the box itself), there are spelling mistakes on the box or other strange errors. Also, look at how the product works. If you do not receive the option of telephone activation or there are error messages upon loading (or it crashes or simply will not load) then chances are very good it is a pirated version. Legitimate versions of Photo Shop will certainly at least load and work once installed! Anytime you have a software program that is both very popular and very expensive, there are bound to be those who will resort to dishonest methods in order to obtain a copy. This is simply human nature. Counterfeiting software is actually quite a big business. I am also quite sure that Adobe is aware of the problem and there must be some good reasons why they really have not attempted to crack down on the problem more. The funny thing about this particular piece of software is that it is sooo powerful that probably most users will never really even use anywhere near all of the functions that it is capable of. This means that for most people, finding a scaled down version would be better than trying to find a pirated version at half off the retail price. There are some really good alternatives to Photo Shop as well. Adobe even produces a scaled down version themselves! Perhaps this is in response to the situation, knowing that their high end product is pirated so often? There are other programs which a user might want to consider as well, including GIMP.